The good thing is that it’s the perfect time to try out new layer combinations in your outfits…to combat those chilly mornings but to be prepared for the warmer afternoons. I’ve always been a fan of layering…you know it was polo shirts and socks in the ’80’s, plaid flannel in the 90’s, tanks over fitted tees in the 2000’s, and now button downs under sweatshirts, of course. 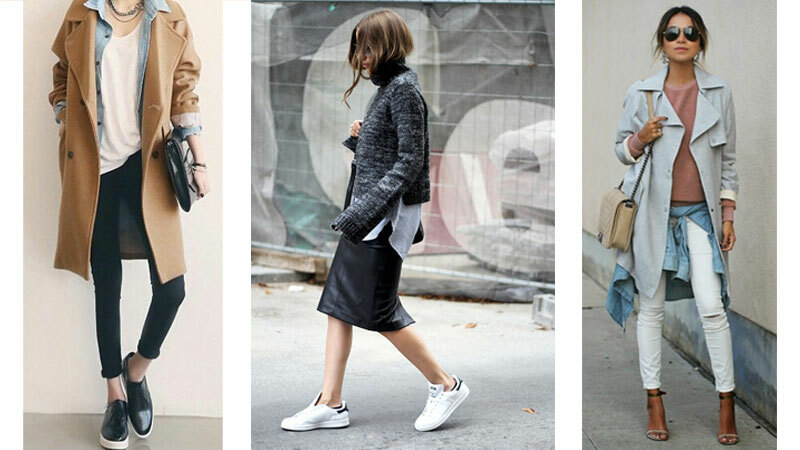 Layering is the best trick to make outfits more interesting. I’ve gathered up a few of my favorite layered looks from Pinterest and am breaking them down so we can figure out how to emulate them together. White jeans and trench coats are a classic combination. Love how she modernized this pairing with a sweatshirt and denim shirt. For spring, keep colors soft, as she did here. The shirt looks cool tied, but if you actually needed the extra layer, it would look just as good worn under the sweatshirt, tails peeking out. Keep the look cohesive with neutral sandals, bag and sunglasses. Extra points for major earrings. This is another great combo for the chilly, early spring days. 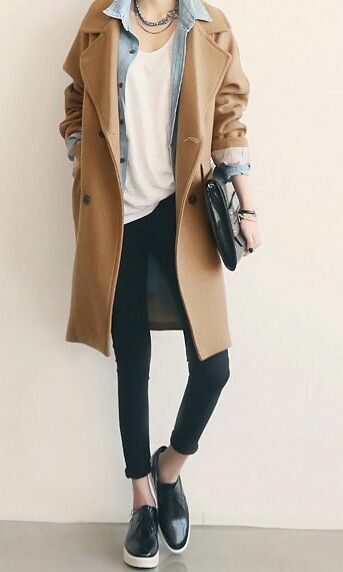 Start with a simple tee, long or short sleeved depending on your climate, add a denim button down and top it off with either a wool camel coat like this or a trench coat in a similar tone if it’s already a bit warmer out. Black skinnies and black oxford-style sneakers keep it from looking too preppy. The structured and oversized black clutch takes it up a notch, but a beautiful black leather backpack would also be lovely and practical. For the jewelry, layer a few simple necklaces and bracelets to add a feminine touch that’s not too fussy. This. A twist on classic.. and easy. We know blazers are great at making an outfit look pulled together, but add a denim vest underneath to not only create interest, but to add the perfect casual cool vibe to the outfit. And unlike a denim jacket, the vest will fit perfectly under jackets and allow you to have that unexpected layer peeking out. Wear a simple v-neck or henley tee underneath in a softer/lighter tone than the blazer. The statement necklace here gets a little lost. I would opt for simple layered silver necklaces with this gray-toned outfit, gold if you’re wearing warmer colors. I wanted to include an outfit with a skirt or dress and this outfit is so super cool. It would look great with a fitted tank midi dress in place of the skirt, too. A knitted tank dress or a knit pencil skirt would be more comfortable and practical for everyday. But for real, go with a leather skirt if you can. So rad. This combination would also be amazing for travel…you can shed the layers or put them back on with changing temps. The sneakers add the perfect sporty vibe and are comfy for daytime, but this could easily transition to evening with some lovely strappy black heels. Love. I tried my hand at styling with some of the outfits above in mind. You may have seen it already over on my Instagram account (@elletrain). It was perfect for the temps here to have a few layers. I actually had four tops on here. ALL THE LAYERS! Tank, sweatshirt, denim button-down, blazer or trench. I really liked how the sneaker and sweatshirt gave it a sporty vibe. (Also, this photo makes me realize how much I need a new lamp…ugh). P.S. 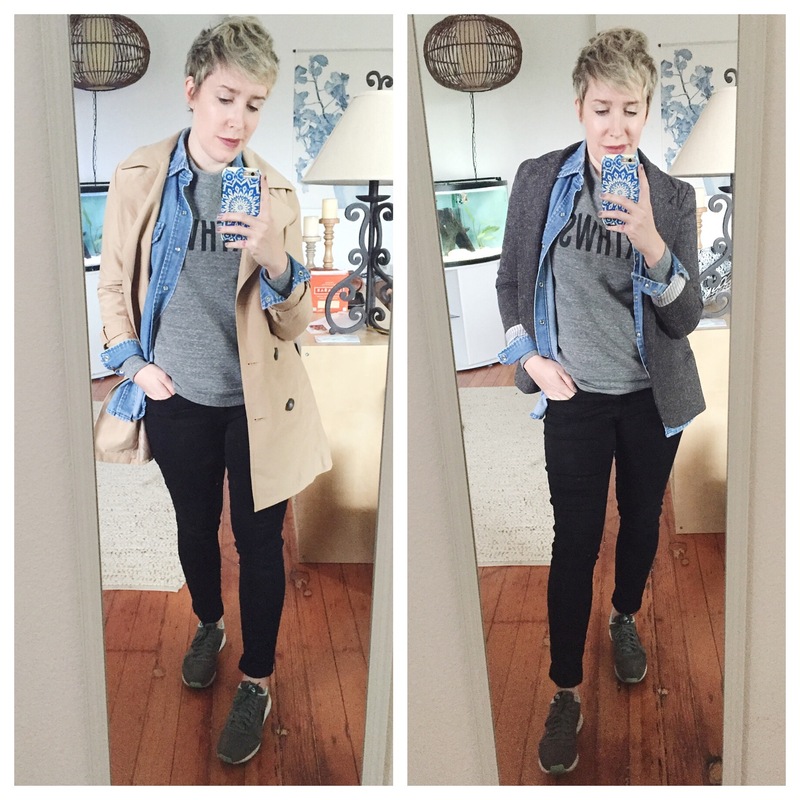 Petite mama friends…I LOVE this trench. Finally one that is the perfect length for those of us who are slightly vertically challenged. Which is your favorite look from the post? They share some similar pieces which makes me excited to try them all! Let me know if you put any of these pairings together and be sure to tag your photos with #myeverydayedit on Instagram so we can see them! The post Spring Layers: Four Easy Outfits From Pinterest To Copy Right Now appeared first on The Mom Edit.